This has been a strange season for us. We ordered our seeds early, and then we had a nice warm trend, followed by a very cold snap. We intended to plant just before Easter, but we had too much rain, and then we got busy, and each day we were going to plant, our garden spot was being soaked. So we didn’t get to plant until the end of April. The nice thing about planting so late is that it is pretty much safe to plant just about anything, except of course, the cold crops like lettuce, cabbage, and broccoli. We had the best intentions of growing all kinds of things we hadn’t actually grown last year–things like carrots, beets, lettuce, and cabbage. So far the carrots are not even trying to come up and the beets are making a poor showing. We have spent a couple of sessions out in the garden weeding and doing things like installing the poles for the pole beans. I worked the post-hole diggers this time as the Handy Man was running the tiller. 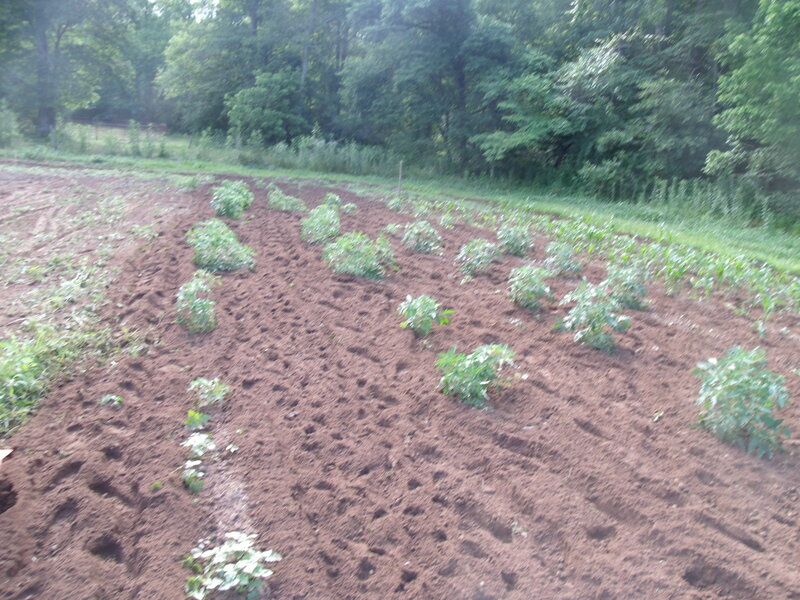 our first three rows of green beans…looking good! Why yes, we did plant over 50 tomato plants. Why do you ask? 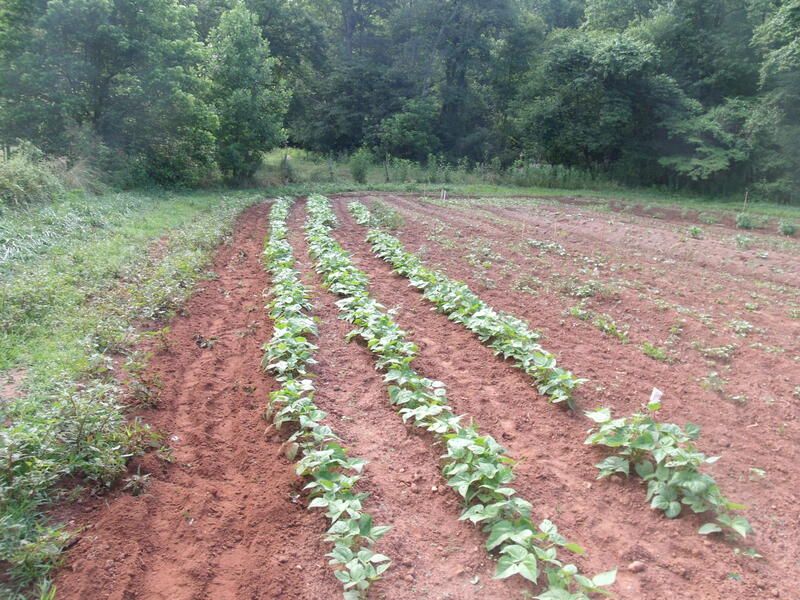 There, just beyond our squash, cucumbers and melons, we have pole beans. I planted the poles myself, and I let the girls plant the beans. When the beans get high enough, we will run wire between the poles to hold the bean vines. 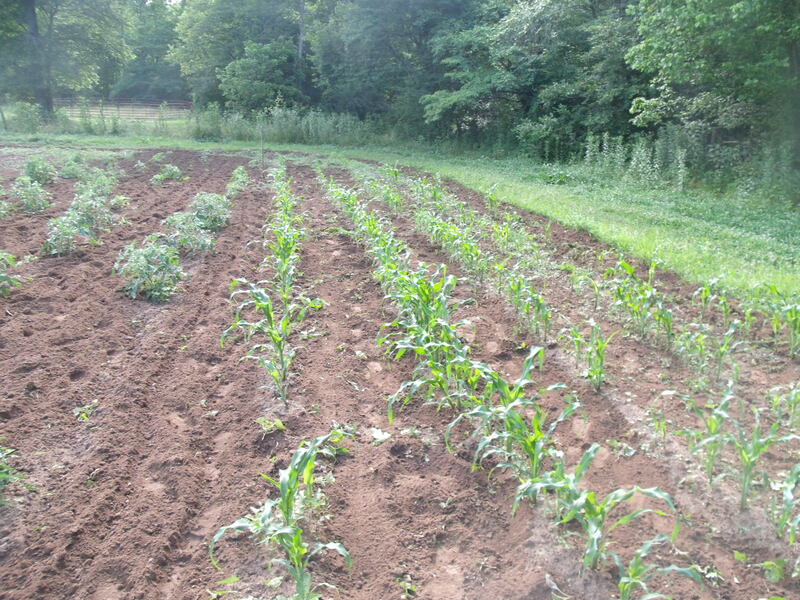 We finally did plant some swiss chard, there between the pole beans and the tomatoes, but we still have corn and beans we have not planted, and to be honest, I am not sure if they will get in or not. It doesn’t appear our okra is doing all that well, either. This summer has been crazy so far. We are still finishing school–and will be over the summer–t0 get in the last few credits Dee needs for her high school transcript before she heads off to college. We do have one more year, but she will be taking a few classes at the local college for dual-enrollment as well as Spanish 3 and Analytical Literature with a local teacher. Along with the rest of her math, she will have a very busy year, hence our need to dispense with as much as we can this summer. The Handy Man and the girls also have GAP–the Gainesville Aid Project–which is a work-based ministry that ministers to the needy elderly or handicapped folks in the city an hour away. It is only ten days, but it makes for a busy June! The girls are also involved in the local 4-H program and music lessons. Dee and I are looking at colleges this summer as we begin to figure out where she will spend four years of her life maturing and preparing for the future. 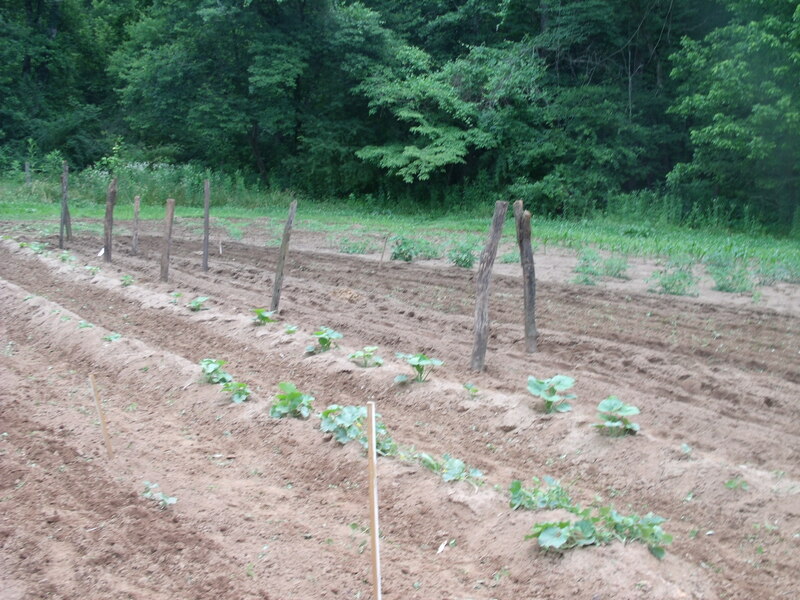 And oh, yeah, we do have a garden to tend and vegetables to put up! I am going to try to savor the days we have this summer. I know it will be busy–busier even than last summer, if that is possible, but I also know this is a season of life. 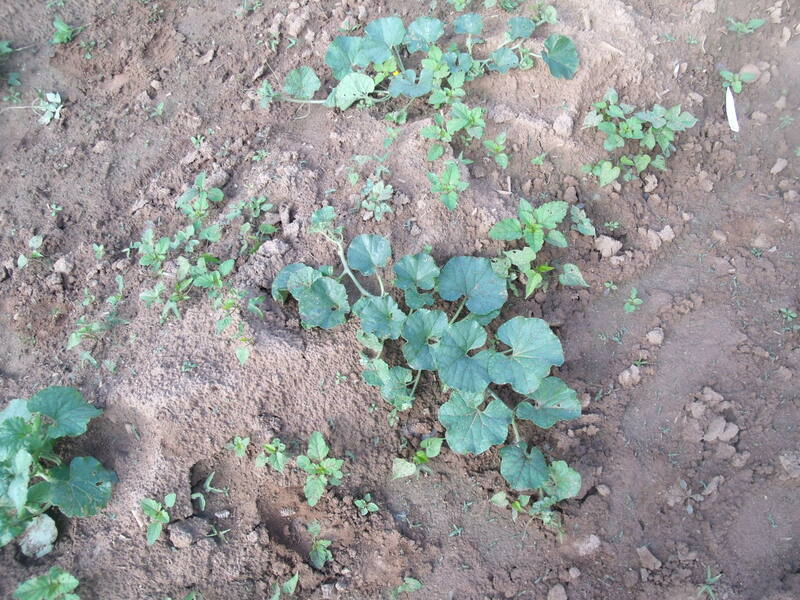 Just as my garden grows up and then dies back down, so do the seasons of motherhood and family life. This, too, shall pass. To my half-dozen regular readers–God bless you! I appreciate you more than you know! If you don’t see a lot of posts from me in the next few months, it is a good guess I am either gardening, canning, schooling or sleeping. Keep posting when you are able!! I LOVE LOVE LOVE reading especially about your gardening efforts…didn’t get to plant this year..so that makes hearing about yours even more fun! Good job Dailey family!